God bless thee, dearest . .
WELCH & LENTON on the other. 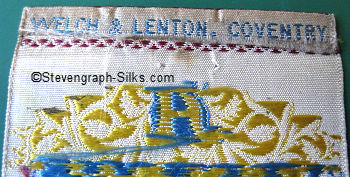 The two bookmarks above were both made by Welch & Lenton, with their name woven on the reverse top turnover of both. design being identical to that of Welch & Lenton. It would seem therefore that THOMAS BAND were only a marketing outlet.